In celebration of the 40th Year of ASEAN-Japan Friendship and Cooperation, the University of the Philippines Center for International Studies (UPCIS) partners with the Embassy of Japan, Japan Foundation Manila, Department of Tourism’s Intramuros Administration, National Commission for Culture and the Arts, and the Cultural Center of the Philippines in the week-long Papet at Maskara: Celebrating 40 Years of ASEAN-Japan Friendship and Cooperation through Intercultural Collaboration as Dialogue. Held at Mestranza Park, Intramuros, Manila on February 11, 2013, 7PM, an excerpt from UP University Professor Emeritus Amelia Lapena-Bonifacio’s CCP winning play re-tells the story of Sisa, from Jose Rizal’s novel Noli Me Tangere. 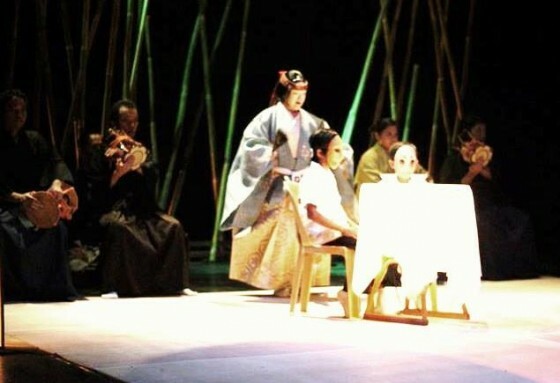 In this re-interpretation as a Japanese Noh play, Sisa confronts Padre Salvi and reunites with her two sons, Crispin and Basilio, and regains her sanity and peace of mind. The play is stagged as a Shinsaku (newly-created) Noh with dance, chant, drums with vocal music, costume and mask. ‹ PreMYo Rizal Judge & National Artist Rio Alma Launches "ANG ROMANSA NG PAGSAGIP NG OSONG MARSO"